Last Thursday, our City Council took the first step in legalizing and regulating the short-term rental industry in New Orleans. In a 6-1 vote, with CM Jared Brossett dissenting, the Council voted to pass a motion that included a draft of last-minute revisions proposed by Mayor Mitch Landrieu. Almost all of what passed was at odds with the policy positions of NOLA Neighbors, a citywide coalition of neighborhoods and citizens who want to see reasonable and enforceable STR rules put in place. VCPORA has been, and continues to be, a signatory to the NOLA Neighborhoods policy platform, and judging by those standards, the council action fell fall short. we still have the opportunity to convince the Council to put common-sense provisions in the ordinance. And what’s happening in three other American cities right now could be immensely helpful in that effort. San Francisco, Portland, and New York (both City and state) have chosen to play hardball with the STR platforms, and they’ve got the the industry on the ropes. Airbnb has sued its hometown of San Francisco in federal court over enforcement of a law that Airbnb itself helped to craft. A ruling is expected within weeks. The law in question fines Airbnb, and any STR platform, $1000 for every illegal listing. Airbnb has cited the Communications Decency Act in its defense, claiming that it is merely a platform and not responsible for the content on its site, despite taking a percentage of every transaction and even offering insurance to its users. U.S. District Judge James Donato seems skeptical of those claims. Last week, in New York, Governor Andrew Cuomo signed into law a bill banning all rentals of fewer than 30 days. The law carries significant penalties of up to $7500 per incident, enough to be a significant deterrent. Observers estimate that more than half of the 45,000 listings in New York City alone are operating illegally, and would be subject to these fines. In Portland, city officials have fined Austin-based Homeaway and its affiliate VRBO a whopping $2.5 million for violations of the city’s STR policy; namely, failure to provide the city with the names and addresses of hosts, failure to register those hosts with the city, failure to display permits, and failure to collect taxes. The governments of these cities (and state) have made a choice to put their residents first, and to set and enforce rules that are in the public interest, rather than the industry’s. Bravo! So what did our City Council actually vote for? 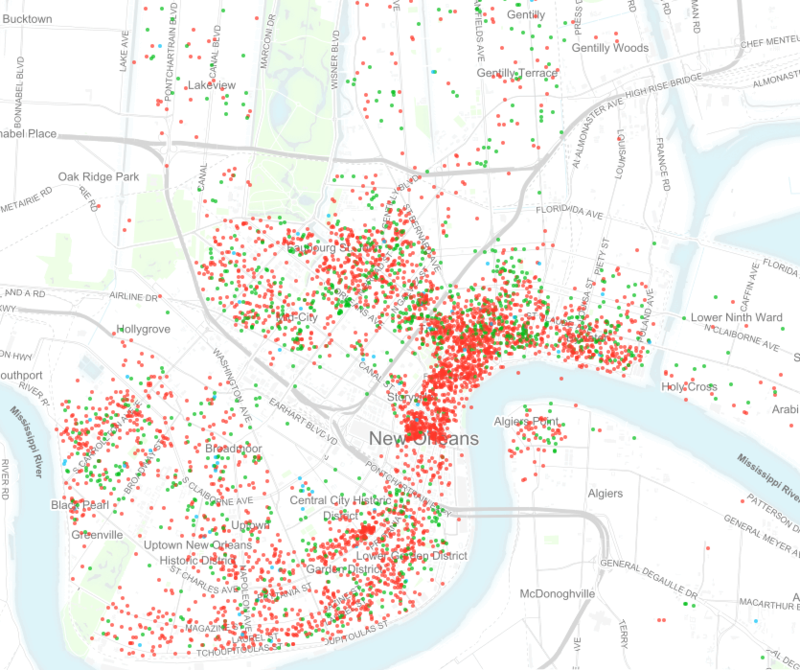 One of NOLA Neighbors’ primary objectives, shared by virtually everyone (except those making money off of illegal STRs), was to do away with the whole-house rental category. The mayor’s package of amendments seemed to remove that as a category, but then changed the terms of the “temporary” category to allow for intense use – 120 days, whittled down to 90 days during the council meeting – which is essentially whole-house rentals under a different name. In a nutshell, whole-house rentals would still be allowed in residential neighborhoods. Another key element that seemed to have near-universal support was to require that “temporary” rentals be allowed only for properties that have homestead exemptions, so that the spirit of the category – allowing families to rent their homes while taking vacations over Jazz Fest, etc. – would be preserved. CM Susan Guidry introduced an amendment to that effect, but it was voted down 4-3. What that means is that investors, be they individuals or corporations, locally-based or from out-of-state, can continue to buy up an unlimited number of housing units and convert them into de facto hotels. Making matters worse, there are no caps on the number of “temporary” STRs in a given area or even on a given block. That means that every house on your block could be a “temporary” STR, bought up by an out-of-state corporation, not lived in, in any sense of that term, and rented to tourists for 90 nights a year. In commercial zones, the problem is even greater. There would be no limits of any kind, not even how often the property could be rented out. The zoning that we’ve long had which limits hotel use to certain areas would be effectively erased, and every commercial piece of land could become a de facto hotel. Increased enforcement: by allowing citizens and neighbors to know where legal STRs are operating, the pool of those who can help monitor and enforce is enlarged, and citizens can help take some of the load off of the city. Transparency and trust: anyone living in a neighborhood, or looking to buy property, has the right to know how many nearby properties are de facto hotels. The anguished boos in the council chamber on the 20th were not the wild-eyed cry of misguided fanatics calling for a ban on STRs. It was the indignant incredulity of a diverse group of people — black, white, rich, poor, young, old, representing every council district and different walks of life. Will the Council realize how strongly voters feel about fair regulations and enforceable rules? Will they reconsider adding common-sense amendments? And a HUGE thank you to everyone who called, emailed, and came to the Council meeting. We’ll need your help again!